Posted at 15:41. Tags: Google Chrome, test. Categories: browsers, Mozilla Firefox. Both comments and trackbacks are closed. Awesome post!That was a lot of work and I personally appreciate it. We can hope that others will accept it but that’s doubtful. I just don’t understand how Firefox (and Mozilla) have become the enemy.People just can’t stand success I suppose. awesome, your right why would anyone with firefox even consider any other broswer let alone switch? An awesome blog and much appreciated :)Firefox For Life! Whether the feature gets in your way seems a bit irrelevant. The fact is, Firefox has been packing on features that could have easily stayed as extensions. Kevin, if those features are useful to 95% of Firefox users, why should they remain as extensions if they don’t get in the way and don’t slow the program down? First how do they Mozilla developers know that feature x is useful to 95% of users? And if Mozilla introduces a feature in a Firefox beta, then all the people who don’t beta test will not have a chance to give feedback.As for features, live bookmarks can slow down Firefox, and the new bookmark and history system in Firefox 3 is known to annoy and/or inconvenience several users. With people like Kier making bold statements completely unsupported by anything whatsoever, it’s no wonder the IT landscape is a lot like offroading on a lava bed. Thank you!I’m tired of people complaining that Firefox is old and slow, and that the chrome etc are better.Firefox 3.0 is a great well rounded browser, 3.5 is even better. This is great data to have, trending across the historical.We always focus on performance; the plurality of our community means that as soon as we start looking at adding to the product, someone else starts asking what we can take away or optimize. It’s a great system, really.Many thanks, David. Thanks Mike and everyone else for the encouraging words. I enjoy doing this stuff and I’m thinking of doing a similar comparison between …Chrome 2bSafari 4bFirefox 3.1b3IE8and why not Opera 10a while I’m at it?This post has seen a fairly huge load of traffic since I wrote it. Glad to see so many are getting some facts and not just the usual FUD. Thanks.I didn’t really call this a benchmark until others did though.The variances in the tests where small – the actual times were always pretty close to the averages in the graphs. Even for the warm starts the differences between browsers were clear, though small.I’m pretty confident most of the differences would have checked out with a real statistic analysis.The reason I didn’t do what you just suggested was because I simply didn’t think of it. Might give it a try. Shouldn’t be too hard, even with my limited hacking skills. I think all this stuff about “firefox is bloated” comes from the fact that Chrome is being developed by Google, and advertised even inside your mind.I wonder whether if Chrome had been developed by an small, unknown company and minimally advertised the same statements would had been said.Besides, Chrome isn’t Open-Source. You can’t see its source code, you just can use it freely. The “open-source version” is Chromium, which is almost unknown. 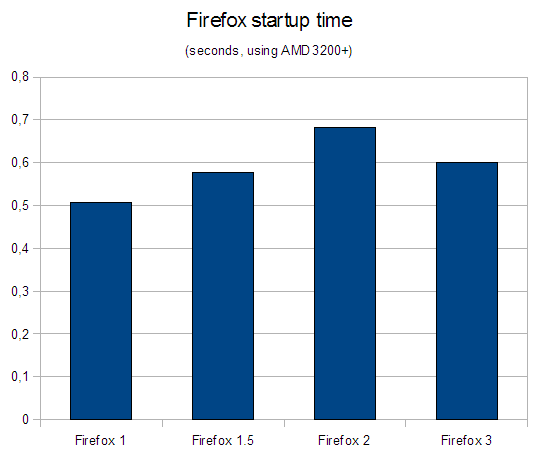 @ Jeff Stewart (and others with the same opinions)”Quick test: starting Firefox 3.0.7 on my AMD Opteron 250 (2.41GHz, 2-processor) after a reboot took about 5-6 seconds. Subsequent startups took 1-3 seconds”Dude are you kidding?Do you mean that Chrome took that long to start up or Firefox?My enabled extensions fluctuates daily but on average, there are always at least 70 enabled and Firefox takes under 30 seconds to start.And this whole start up time with browsers is just plain bulls**t and whining anyways.Lets be real.What is the most common and popular thing that people do with a PC?They go online to use and browse the Internet. And for many, starting their browser is the first application opened after starting up their OS which in Windows takes what? 5 or more minutes?So 10, 20, even 30 seconds is worth bitching about?I just don’t get it.For me, once Firefox is open, it stays up until I shut down my PC and I suspect that is the case for most people regardless of their choice of browser.I’m not an idiot, I’m well informed, I’ve been using computers since the early 80’s when I got a TRS-80 MC-10 Micro Color Computer, I’ve been using the Internet consistently since 1998, I’ve tested thousands of applications of all kinds and so I’d hate to think that at this point in time that I wouldn’t be able to recognize and choose the best overall software of its kind and in this case, it’s Firefox. Add-ons or not, just checking email and Facebook or whatever, Firefox is the best browser that I’ve ever used and I have tried Chrome, Opera, Avant and others.And for the record yes, extensions will affect startup time. I just created a new Firefox profile and it took 5 seconds to fully load.If you have the need to shave off seconds off of your life to load a sub-par browser, then perhaps Chrome is for you after all, but I don’t mind waiting a few more seconds than you to use the best and most complete.I’ve had farts that have lasted longer than it takes Firefox to load. But I suppose for some reading this, I should probably change my shorts after that sort of length of time (or burn them). Here, here! 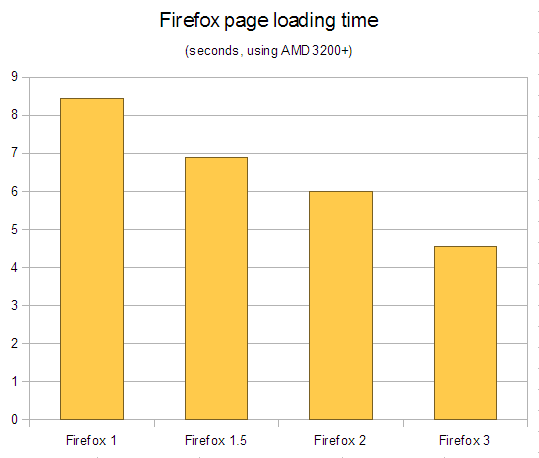 Firefox isn’t becoming more bloated, it’s becoming easier to use than ever. And faster! Great post and great review!I too think Firefox deserves more respect and less “insane-browser-prophecies”. “Chrome is lightning fast, with sub-second startups regardless of the scenario (I rate startup time as probably the most important factor in choosing a browser).”This is something I simply don’t understand, although I have seen similar statements before.How can the time it takes to start a browser possibly be the most important factor in choosing a browser? How much time do you spend on _starting_ a browser vs actually _using_ it? Even if you just spend ten minutes per day actually surfing the web, your time spent on the web will be orders of magnitudes longer than the time your browser spent launching. Saying that the launch speed of a browser is the most important factor is just plain wrong.Yet, it seems to have a pretty massive psychological effect — it “feels” a lot faster. I was a die-hard FF person, but after FF3, I have given up. I wen back to FF2 for a few months waiting for the fix to come. After being unable to play Netflix in a down version, I upgraded back up to FF3. Basically, FF starts up, but if I try to access my toolbar, favorites etc, it is frozen. I had just as many bookmarks and live bookmarks as before.. Why won’t someone at FF fix this? I tried a bunch of the fixes listed by others on the internet, and none have helped. Tonight I downloaded Chrome and IE8. I am sad to be saying goodbye to Firefox. Yes… loading time and memory consumption are really important for sure, you got a point here. But if we speak about java script performance… _unfortunately_, I will have to point that out:http://www.chromeexperiments.com/Try it with both FF and Chrome, and see what happens… really sorry. 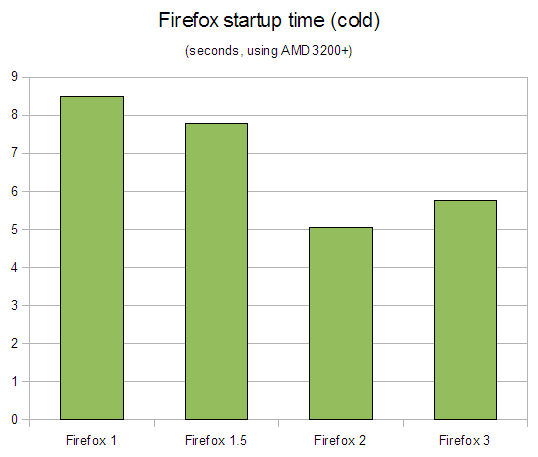 Firefox 2 went like greased lightning on my system (WinXP 1.66GHz core duo), but Firefox 3.0.8 is slow as hell, and likes to crash lots. My enabled extensions fluctuates daily but on average, there are always at least 70 enabled and Firefox takes under 30 seconds to start.So 10, 20, even 30 seconds is worth bitching about?30 seconds?On my laptop Vista takes only 10 seconds more to load, and here the fanboys still refuse to admit that Firefox is bloated to kingdom come.Amazing. @ Kevin:"And if Mozilla introduces a feature in a Firefox beta, then all the people who don't beta test will not have a chance to give feedback. "It stands to reason that those who actually cared about giving feedback would be participating in the beta. Firefox regularly consumes up to a gigabyte of RAM on my machine. If I restart it with the exact same tabs it will typically take only 400-500 megs. That looks like a memory leak to me, but what justification can Firefox give for needing 1 GIGABYTE of ram to render 10 or so tabs? Before you ask – I only have a few plugins – Firebug, Google Toolbar, and Accuweather. Sorry, as loyal as I have been to Firefox, I’m really looking for a lightweight and quick browser. I’m on a Mac and was a diehard Firefox fan but as the day went on, it took a gig of RAM and really slowed down. I’m using Google Toolbar, Web Developer and Firebug. I got tired of having to restart Firefox when it was ridiculously slow so I’ve gone back to Safari which is using only 1.5 MB of RAM. 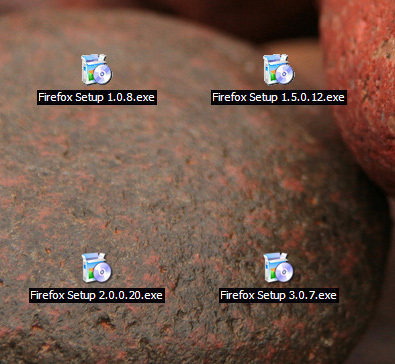 Now I only use Firefox for Web Developer or Firebug. Such a shame. I miss it and hope for a better version soon.